School’s out for the week! There’s plenty to keep the kids — and adults! — occupied between May 26th and June 3rd, whether it’s family events at Portsmouth Historic Dockyard, all-ages shows at the Kings Theatre and New Theatre Royal, or Mutiny Festival for the young adults. Want more Portsmouth & Southsea events news? You'll join over 6,000 other locals receiving our weekly Portsmouth and Southsea centric 'What's on' guide. Mary Rose Museum, in partnership with LEGO building company Bright Bricks, are giving LEGO brick enthusiasts the opportunity to recreate Holbein's portrait of Henry VIII in the form of a four-metre high LEGO brick mosaic, between Saturday 26th May and Sunday 3rd June. The Love Southsea Markets have been an established monthly staple of shopping in Palmerston Road for five years. The next one takes place on the Saturday 2nd/Sunday 3rd June weekend. The new Love Cosham Market in the north of the city, meanwhile, takes place every Saturday. The People’s Theatre Company bring one of the world’s best-loved nursery rhymes to life to celebrate the story’s 45th anniversary! Written especially for adults to enjoy with their youngsters, this hour-long show features singalong favourites like If You’re Happy and You Know It and Incy Wincy Spider. Tickets start at £10. As per tradition, Southsea Bandstand soon returns for the summer, offering a programme of the best free local outdoor music performances from singers, bands, and DJs. 2018’s programme kicks off at the same time as the half-term break! The bandstand’s sited in the West Battery Gardens down on Southsea’s seafront. And, as always, all shows are free. 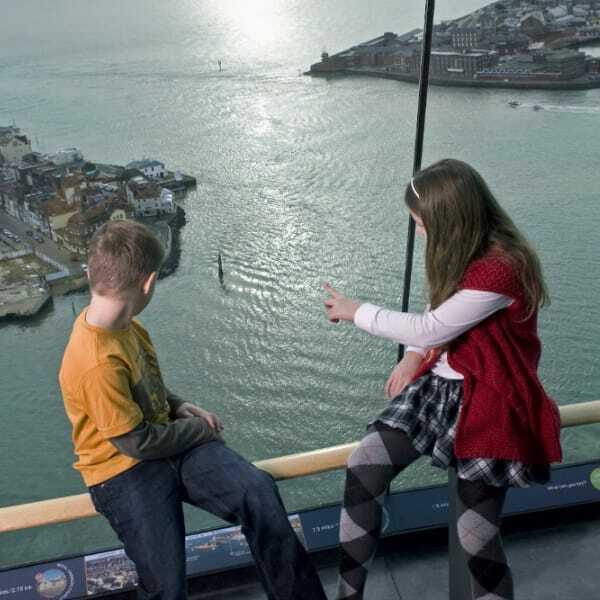 Enjoy a week of fun family events at the Spinnaker Tower — their Harbour Life Half-Term programme is themed around all things nautical. Find out about plastic pollution and how you can tackle it with The Final Straw (featured in the TLMedia podcast below), explore the world of oysters with the Institute of Marine Science, learn about the history of the Gosport Ferry, and get creative with local artist Ian Whitmore then take your print home with you! Whether you’re already a keen skater or the only thing you’ve ridden with wheels is a taxi, make tracks for Southsea Skatepark — featured in the TLMedia podcast below — for their next Roller Disco on Saturday 2nd June. Learn from some of the best and let loose to a soundtrack spun by The K Sessions between 7:00pm and 10:00pm. Zippos present Cirque Berserk, a circus show especially designed for the theatre! This jaw-dropping spectacle celebrates the 250th anniversary of the invention of the circus, with cirque-styled artistry, adrenaline-fuelled stunt action, jugglers, drummers, aerialists, and the legendary motorcycle ‘Globe of Death’! This half-term, Portsmouth Historic Dockyard are offering free entry for kids. Between 26th May and 3rd June, any £32 full-price adult 11-attraction annual pass admits children for free. Dockyard highlights during the half-term include Victorian-style fitness challenges aboard HMS Warrior 1860, craft activities, and character trails. The Andrew Simpson Watersports Centre are running sailing, windsurfing, activity camps, and junior ‘sea monkey’ sailing sessions this half-term, at their headquarters on the Eastern Road. There’s kit for hire for all ages, and there are also land activities such as the climbing wall for those who’d rather stay dry! Find out more and make a booking by calling the watersports centre on 02392 663 873 or visiting aswc.co.uk/activities. Gunwharf Quays’ Plaza will welcome over a dozen innovative street food vendors, giving visitors the opportunity to sample some of the finest street food on offer in the region from 26th to 28th May. Shoppers will have the chance to give their feedback on the tastiest dishes, sampling dishes and voting for their favourite. Aspex Gallery’s weekly Mini Makers session continues in the half-term holiday, on Wednesday 30th May from 10:30am ‘til 11:30am. Each Mini Makers workshop is inspired by storybooks from the Portsmouth Library Service, and incorporates painting, stamping, and collaging. No booking required.